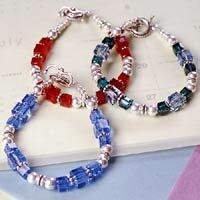 Celebrate your birthday every day with this easy-to-make swarovski bead bracelet in birthstone colors. These vibrant trinkets make perfect gifts for friends too. Note: To increase or decrease length, add or remove 5 mm sterling silver rondelle spacer beads and 4 mm seamless, smooth sterling silver beads. Thread a crimp bead on one end of beading wire, pass wire through the end of toggle clasp, and run wire back through the crimp bead in the opposite direction. Flatten the crimp bead firmly. Trim the end. Continue pattern until all the beads are used. Thread a crimp bead on the end of the wire and pass it through the remaining clasp. Run wire back through crimp bead in opposite direction. Flatten crimp bead. Trim end.